Recently a team from the Animal Parasitic Diseases Laboratory and Washington University’s School of Medicine took a look at DNA from 46 different Toxoplasma gondii strains. 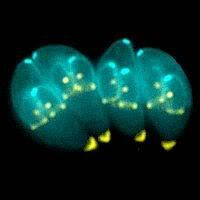 If you search the term it seems to be a very hot topic of study these days and you can find complete studies on toxoplasma gondii online. If you missed it, I recently wrote about Toxoplasmosis and risks of infection from cats. Anyway, the news is that the study team was able to identify the chromosome that is responsible for the evolutionary adaptation that is theorized to be behind the parasite’s transmission between organisms. Although this is an early development, the hope is that further studies will reveal new ways to get this parasite under control. Another development will be good news for the 2-5% of Labrador owners whose dogs are affected by exercise induced collapse also known as EIC. According to the Working Retriever, the disorder has been around for at least 20 years but not identified until recently. The symptoms of the EIC condition are that the animal’s hind legs become wobbly or give out after intense exercise. Research has revealed that up to 30% of Labradors carry the mutation which can be identified through a genetic test. Chesapeake Bay and curly-coated retrievers also have the gene mutation. Teams from the University of Minnesota’s College of Veterinary Medicine and the University of Saskatchewan’s Western College of Veterinary Medicine identified a gene that is believed to be associated with EIC. The findings were published in Nature Genetics and the hope is that the EIC testing will help confirm diagnosis and enable dog breeders to avoid passing the mutated gene to puppies.